Congratulations Winnipeg. I never thought it would happen. When the Jets left I was 13. I emptied my piggy bank. I donated money to the Save the Jets campaign. I attended a rally. But the Jets left anyway, and then I left Winnipeg. Even when it was announced that Winnipeg would get a team, I wasn’t sure if fans would buy in. The Jets always had lots of fans, just not enough to fill the seats. Winnipeg is a cheap city. I remember CBC blacking out local games so people wouldn’t just stay home and watch them on tv. I guess things have changed, because the season tickets sold out in 17 minutes. All 13,000 are gone. Impressive. So, good luck Winnipeg. I hope the team does well and the fans stick with them. But I have a new team now. And they’re two wins away from the Stanley Cup. 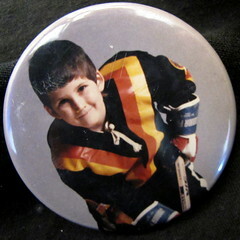 Go Canucks Go! Are Bikes Bad for Business? The Hornby separated bike lane is still a week away from being approved by city council, but the lane is generating lots of controversy already. The local business community is campaigning against the bike lane warning the loss of car capacity and parking will hurt businesses. It is difficult to take their warnings seriously when they also said the same thing about the Burrard Bridge and Dunsmuir bike lanes, and the sky hasn’t fallen. It is surprising and disappointing to hear that a lot of business owners still think catering to cars is a necessary ingredient for success, especially within downtown Vancouver. Most people who live and work downtown don’t use a car – they walk, take public transit and cycle (as was shown in a recent survey). 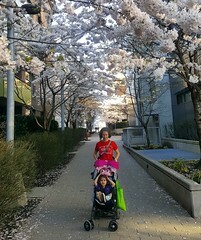 Downtown Vancouver has thrived because it has created a dense neighbourhood that can be accessed without a car. “According to a 2007 study Vancouver has, since 1997, seen its population increase by 27 per cent, and jobs by 18 per cent, yet 10 per cent fewer cars are entering the city than a decade ago. Pedestrian trips have risen by 44 per cent, cycling by 180 per cent, and transit use by 50 per cent.” (Divided they Ride). In fairness, not all businesses are opposed to increased cycling infrastructure. The VACC has started a new Business for Bikes program to help businesses reach out to cyclists. Gordon Price has been doing a series of posts on Bikes and Business (more here.) illustrating the positive economics of cycling, which I highly recommend reading. 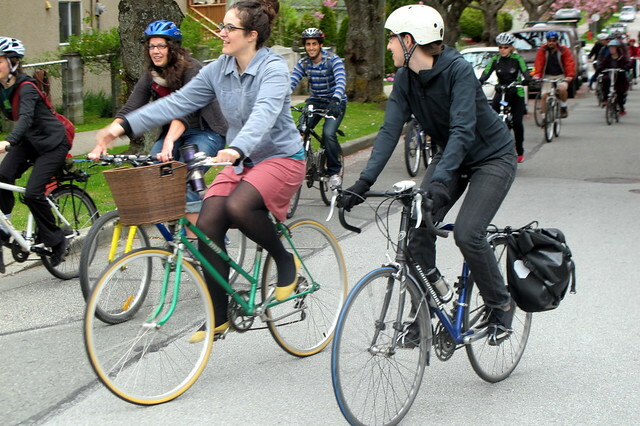 There is also a piece in the Vancouver Sun on Bikes vs. cars: Who pays their fair share? to blunt arguments that cyclists should be paying more to have bike lanes. Luckily, it looks like the bike lane on Hornby will be approved despite the opposition of some businesses. I’m really happy Vancouver has a mayor and city council that is willing to push forward with change. The same can’t be said for Winnipeg where Mayor Katz is cancelling bike routes. Winnipeg is a car-dependent city, and that is unlikely to change anytime soon. The car-dependent culture and lack of cycling infrastructure are the biggest reasons keeping me from moving back. When I was in Winnipeg in July, I walked down Wolesely, a quiet residential street that is also a bike route. There were signs reminding cyclists to share the road, but nothing reminding cars. The few cyclists we did see were biking on sidewalks, not the street – which tells you how safe it is to ride down bike routes in Winnipeg. Compared to Vancouver, traffic congestion in Winnipeg is much worse and their downtown has been in a sad state for decades. Maybe the solution is to build elevated tracks in the sky and let people bike in enclosed bubbles, as proposed by Shweeb. Like all personal rapid transit projects envisioned before, it is fascinating but likely doomed to failure. It is difficult to build incrementally in a way that even the first iterations are convenient to lots of people. Not everyone wants to travel in isolated pods. And special to Shweeb, not everyone wants to get into a pod smelling like some other sweaty cyclist. I wasn’t a very cool or sophisticated teenager. I know this because despite having lived in Winnipeg for 19 years, I didn’t attend the Winnipeg Folk Festival once. In my later years I wanted to go, but was too intimidated by the rumours of it being a non-stop crazy party. Since I moved to Vancouver in 2006, I’ve attended every folk fest, and really enjoyed lying in the sun, lounging on the beach, and listening to folk and roots music. Unfortunately, Vancouver’s 3-day, no-camping, stroll in the park folk festival is nothing compared to Canada’s biggest and baddest folk festival in Winnipeg. Winnipeg Folk Festival is 5 days long (2 evenings and 3 full days of music); the festival campground is a mini Burning Man with performance art, parades, and non-stop drum circles; and nearly twice as many people attend Winnipeg festival compared to Vancouver. Emily and I avoided much of the craziness by staying in the Quiet Campground, but 5 days of baking in the sun and listening to music (as enjoyable as it sounds) was still a tiring experience. Here are some observations that might be helpful to others attending for the first time. Weather – Be prepared for extreme heat during the day (most stages have only a few shade trees), unpredictable downpours, and dropping temperatures at night when the sun sets. Food – There are lots of food vendors in the festival, including some of the best healthy food options in Winnipeg (Mondragon, Tallest Poppy, and Fresh Cafe). However, the prices aren’t cheap. Luckily, you can bring your own food in to the festival. At our campsite we had a cooler with enough food for most of our meals. We would eat breakfast at our campsite, take a packed lunch with us, and then return to the campground for dinner. There is a store in the Festival Campground that sells ice and basic food stuff. Campgrounds – There are two main campground options – Quiet and Festival Campgrounds, plus the Provincial Park Campground (that can be booked separately). Birds Hill Provincial Park is far enough from Winnipeg that you want to camp – plus it is part of the festival experience. One thing to note, is you can camp on Sunday night after the festival ends, and about half the people do. The Festival Campground is capped at 6,000 people , sells out quickly, and has 24-hour-a-day partying. It’s the center of the action and within walking distance of the stages. My sister was in this campground and was usually up until 4 am every morning. She enjoyed watching parades of ninjas and elephants and listening to the impromptu concerts, but complained about the constant drum beats. Saturday morning at 4 am, she drove back to Winnipeg to get 12 hours of uninterrupted sleep. The Quiet Campground is home to families and really friendly folks. The tents are more spread out and it was deadly quiet at night. Each of the 7 areas has a big cooking pagoda with running water and electricity – I was floored to see campers with coffee machines. The biggest problem is the location – 4 km from the festival grounds. A lot of our friends had bikes they used to commute back and forth. Many families drove. We relied on the shuttle. Provincial Park campground – The unofficial camping option. You can book these sites independent of your folk fest ticket. The shuttle stops here and this is where the only showers are. We never used them though, we just walked down to the lake (15-minute walk from the Quiet Campground, but best accessed by bike) and washed off there. Shuttle – Runs reliably every 30 minutes, except at the end of the night when people start leaving and car congestion slows it down. It takes about 10 minutes to get from the festival grounds to the Quiet Campground, and 30 minute to return (as it passes through the provincial park campground). Mosquitoes – Winnipeg is known for bad mosquitoes, but I had assurances from several people that they aren’t a problem during the Folk Festival. Well, that’s partly true. We still got bit in the morning and at dusk, but not too badly. There were thousands of dragonflies patrolling the skies (more then I’ve ever seen in one place before) eating most of the mosquitoes. Demographics – I was really impressed by the range of ages present at the folk festival. The audience is mostly white, but every age group was well represented. There were lots of little kids running around, plenty of partying teenagers, many young people, and lots of grey-haired older folks. Music – The Winnipeg Folk Festival stays true to its roots. Most of the bands were folk, with a good mix of world roots and rhythm and a few indie bands. I was really impressed by the newer artists, like the Avett Brothers, Leeroy Stagger, and Del Barber. The older generation (Levon Helm, John Hiatt, Emmylou Harris, and even Gord Downie) disappointed me. The dancing bands were all really good – Cat Empire and Delhi 2 Dublin had everyone up and dancing. The best part of the folk festival for me has always been about discovering new music and watching bands jam together during the afternoon workshops. The new discoveries for me this year were Hoots and Hellmouth, Leeroy Stagger, and Del Barber. Oddly enough, my favourite workshop was Movin’ On Up, which had 3 bands playing gospel music on Sunday morning. Wow. I know a lot of Aries – including myself. Consequently, the past 3 weeks have been nothing but parties and celebrations. During the Easter weekend, Emily hosted a Creative Sushi Party with lots of “Wacky Maki”. There was also a potluck at Heather’s place on Easter Sunday with loads of yummy food. We also went curling one night and had loads of fun. The weekend after my birthday, we had a shared birthday party for Danielle, Rhea, and I way out at Rhea’s house in Coquitlam. The hot tub was broken, which was a bit of a bummer, but we still had fun. We rocked out with Rock Band, ate lots of good food, and turned out all the lights for Earth Hour 60 – and cracked a bunch of glow sticks and tried to make flaming drinks. Last weekend I flew back to Winnipeg for a surprise birthday party for my Mom. I won’t tell you how old she is, only that it’s a multiple of 10. It was great to see family, friends, and even elementary school teachers that I haven’t seen in years. My Dad did a great job arranging the surprise party for my Mom. She had no idea. When she walked into the room she was stunned, and then when she realized what was happening she spun around and punched Dad in the shoulder. She has been adamant for the past few months that she didn’t want a party. However, considering how much fun everyone had, I think she’ll forgive Dad eventually. The University of Winnipeg – Centre of Canada? Today I realized that the University of Winnipeg is the centre of Canada – at least according to Google Maps. If you go to maps.google.ca (and you don’t have a default location saved) and zoom in as far as possible, you’ll notice it hits the middle the U of W’s campus like a homing missile. In other news, I had a horrible morning when one of my fake teeth fell out while brushing and I spit it down the drain. I spent the whole day without a front tooth (just a peg), and had to ask my landlord to take the sink apart. When I got home after work, there was a bucket under the sink with disgusting water and my tooth at the bottom – it’s sitting in a glass of disinfectant now. The maintenance guy had to replace the whole u-bend of the drain because there wasn’t a trap. Hopefully I’ll have permanent crowns before my birthday and I can forget about all the tooth shenanigans. Dad just called to tell me that our neighbour, 3 houses down, got busted last night for running a grow-op. Apparently they pulled 900 plants out of the house last night. We never heard a thing last night or saw anything unusual this morning. Don’t know who is living there but it used to be a Vietnamese family last I knew.